Orlando's initiative and leadership has been demonstrated in incredible management of the mid-sized composting facilitates, managing double the compost, increased our vermicompost bins, coordination of the quadrupled numbers of volunteers onsite since he started. He has put in place reporting systems, coordinated a compost animation project, working with the Toronto Compost Leaders to build nine compost systems in 2015, and coordinated and trained, through workshops and hands on experiences over 350 people in composting. Orlando demonstrates initiative,and is a team player. This was not only demonstrated in the Compost Coordination, this leadership was demonstrated in School Grown. Orlando independently runs workdays at our farm where he trains, mentors and oversees groups of youth anywhere from 2-15 students each day. Orlando has greatly increased our production yields, implemented record keeping systems, keeps us on track with our crop plan and has trained School Grown students to manage their own school based compost systems. 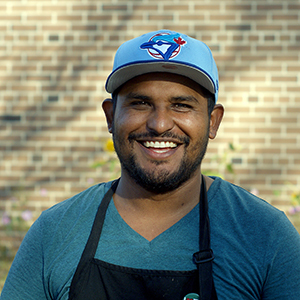 Orlando also mentors and supervises our Canada Jobs Summer Staff - training young people to be phenomenal farmers and passionate about compost. Orlando has lead the installation of our new rooftop irrigation system, involving youth and teaching every step of the way.